One of the absolute best things about living in New York City is constantly being surrounded by art. It’s almost everywhere you look, so long as you’re willing to look up from your phone and look around. Technically, of course, graffiti is illegal, but the line between that and creating publicly has completely blurred. It feels like there’s more public art than ever, as artists take their messages to the street. 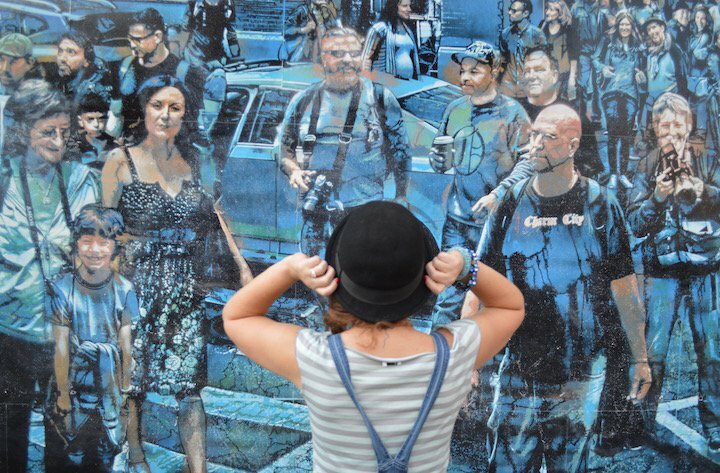 As a storyteller myself, I’m enthralled by other’s perceptions on the world, so I was particularly taken with the new Bowery street mural, which debuted at the end of August. 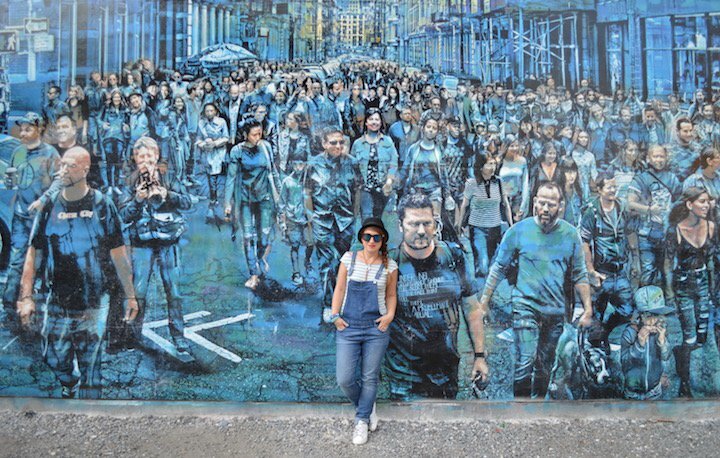 The famous wall, on Bowery street and Houston acts as a rotating canvas, housing different artist’s creations before being painted white, and starting over again. Story of my Life, the latest installment from Logan Hicks depicts a moment from our fast paced, busy lives. 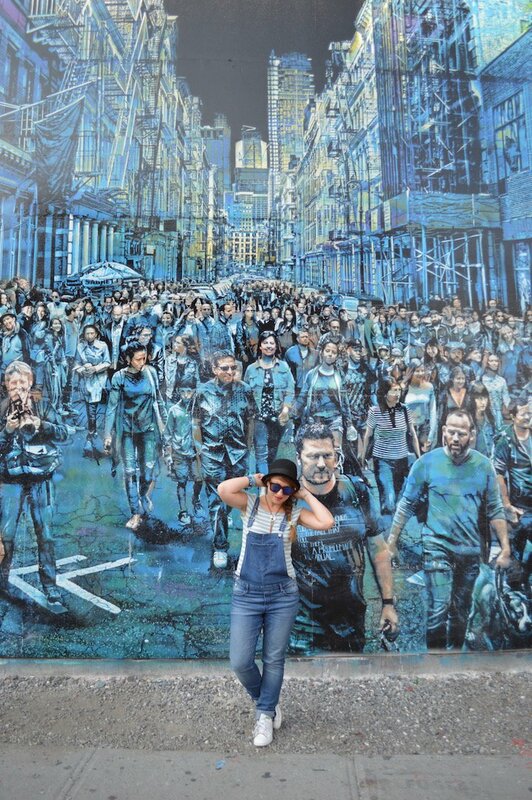 Different faces reflect all our diverse stories, and though we don’t know each other, somehow, something weaves us all together; the city. Hicks even included real people from his own life, including Rosie Perez, and the curator of the mural itself. Come down to take a closer look at Hick’s amazing details, and get a case of the bowery blues for yourself. But be warned: this can be a popular destination and photo spot so bring your good camera and your NYC attitude. Overalls & hat, H&M. Sneakers, Stan Smith. Striped shirt, Agnes. 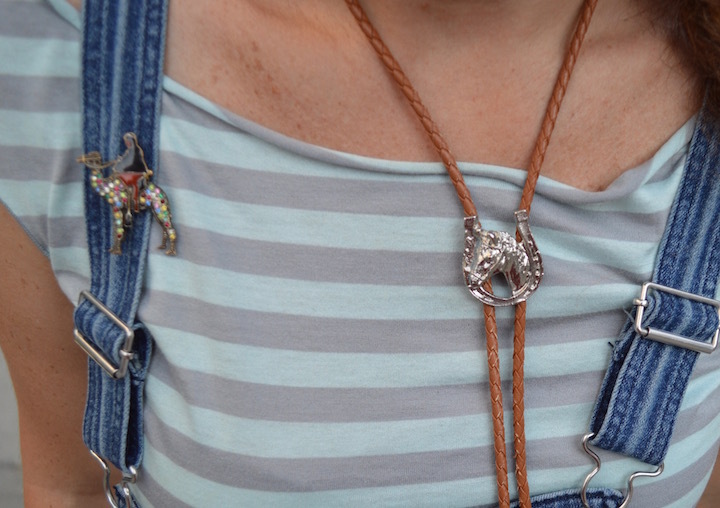 B, Bolero western necklace & pin, thrifted.